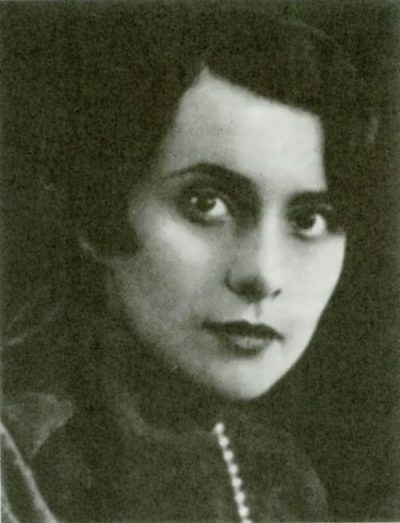 Nina Berberova (1901-1993) was a prolific Russian writer who chronicled the lives of her fellow countrymen living in exile in Berlin, Paris, and New York. She was a contemporary of Vladimir Nabokov, who she greatly admired and who followed the same route of exile. Her memoir traverses three continents and three different cultures, and she was both sympathetic to and critical of them all. She was born in 1901 into an upper-middle class family of mixed origins. Her father was northern (Russian) and her mother southern (Armenian). As a child she had a precocious ambition to establish a profession that would last her for life. Since nothing else seemed suitable, she decided to be ‘a poet’. The memories in her autobiography are linked by their associations rather than by strict chronology. She describes her childhood in the early years of the twentieth century, then her father as a civil servant during the revolution, his appearance as a film extra in the 1930s, then her watching the film as an exile in Paris. It is something of a scatter-gun approach to history. One moment she is playing with dolls, the next, fifty years later, she is liberated by the realisation that what appear to be contradictions within the Self are what constitute the complexities of individual personality. In the same paragraph poor, semi-naked peasants are wallowing in nineteenth-century rural idiocy and sophisticated writers are being shot in Stalin’s purges of the 1930s. Even as a teenager she inhabited an incredibly rich cultural world. She lived on the same street as Mayakovsky and attended readings by poets Blok and Akhmatova, both of whom she knew personally. But suddenly all her youthful dreams of an aesthetic life were swept aside by the February revolution – the causes of which she lays firmly at the feet of Tsar Nicholas II. Her family were forced to move to Moscow then to Rostov in the south. With the country in the grip of civil war, she experienced hunger and deprivation for the first time. In 1921 the family returned to Petersburg where she was ‘permitted’ to join the Poet’s Union by Gumilev (first husband of Anna Akhmatova). He paid court to Berberova (unsuccessfully). Later the same year he was arrested and shot by the Checka as a counter-revolutionary. The next year she met Vladislav Khodasevich, the poet who was to become her first husband. At the same time the threat of political repression was increasingly apparent. It became necessary to ‘survive’ – as many did not. In the early 1920s, whilst it was still miraculously possible to obtain passports, she and Khodasevich left for Europe – never to return. They settled in the first centre of emigration – Berlin – alongside Andrey Bely, Boris Pasternak, and Vladimir Nabokov. For a while they formed part of the ‘family’ surrounding Maxim Gorky. Her initial phase in Berlin is dominated by the figure of Bely, the erratic genius (and author of the masterpiece, Petersburg) who eventually decided to go back to Moscow. There are soirees with the celebrated but talentless Gorky and his mistress/secretary, the spy and double agent Moura Budberg. Nina Berberova was very friendly with Gorky and goes out of her way to present him as an appealing character – but without much success. His fiction was third rate, and he was an abject apologist for Stalin. There are also detailed character sketches of poets Boris Pasternak and Maria Tsvetaeva. Berberova and Khodasevich went on to Prague then Venice. This is very much a memoir of cultural history and even aesthetic philosophy. There are no details of how they earned a living – until they made their way to the second centre of emigration – Paris. There, poverty gripped them so fiercely that Khodasevich thought of attempting suicide, and wanted Berberova to join him. She recalls bitterly how whilst the Russian intelligentsia were being strangled by censorship and physically exterminated with ‘a bullet in the back of the neck’, the Western democracies made no protest and did nothing to alleviate the plight of their fellow writers. Indeed, the likes of George Bernard Shaw, H.G.Wells, and Romain Rolland gave active support to the USSR – completely blind to the lies and the myths of ‘democracy’ promulgated by the Stalin regime. Her account of the 1920s and 1930s in Paris are filled with petty literary rivalries, feuds, and character sketches of the largely doomed expatriates. Curiously enough, she makes little mention of her own enormous productivity. She produced one of the first biographical studies of Tchiakovsy that took account of his homosexuality. She gives a very touching and very honest account of her relationship with Khodasevich. They are comrades, collaborators, lovers, and partners in poverty – yet she concedes to his superiority (though I suspect that more people now read her work than his). Yet she also documents the decline in their relationship. She left him in 1932 and celebrated her single state. Khodasevich took up with another simpler woman, whom Berberova adopted as a sympathetic project even after Khodesevich’s very painful death from cancer. She found her own comfort with painter and writer Nikolai Makeyev with whom she moved to live in a barn on the outskirts of Paris. During the war years she reproduces the brief thoughts and observations she made in a ‘black notebook’ at the time. All is fragmentation, shortages, betrayals, and a reminder that American and English planes bombed (German occupied) Paris. There are also unpleasant reminders of wartime behaviour such as denunciations by neighbours and the looting of unattended properties. Her continuous narrative resumes in 1949 when she reports on the celebrated Viktor Kravchenko affair in which a Russian attache defected and published I Chose Freedom. Shortly afterwards she felt she had reached a low point in her personal life and in her relationship with European culture. She made a completely fresh start by emigrating to America. She had no money and didn’t speak English, but she was befriended and helped by Alexandra Lvovna, the youngest daughter of Leo Tolstoy who ran a relief organisation for expatriates in New York. Berberova worked as a multi-lingual typist and secretary, then later was appointed as Professor of Russian Literature at Princeton. But she skates lightly over her American years on the grounds that at the time of composing her memoir (the early 1960s) many of her friends were still alive. She herself still had thirty years left to live, and she admits that the memoir is ‘cautious’. However, she does end her account on a wonderfully elegiac note. Returning to visit the Paris that had nurtured her for more than two decades, she comes across an ageing Simone de Beauvoir in a restaurant and reflects rather critically on illusions perdues. Then, whilst seeing off a friend at the Gare du Nord, she meets Anna Ahkmatova who is returning to Moscow for the last time. The two women have not met for almost forty years, but two generations and half a lifetime are summed up in the brief gestures of symathy that pass between them. The Italics Are Mine is not on the scale nor is it pitched at the soul-piercing ferocity of Nadeshda Mandelstam’s Hope Against Hope and Hope Abandoned, but it does represent a fascinating and amazingly well-informed account of literature and politics during the European emigration that followed the Russian revolution.